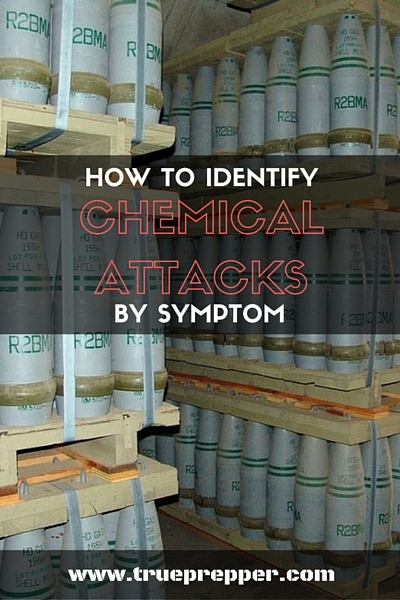 Chemical attacks are not commonplace in our world today, but they do happen. 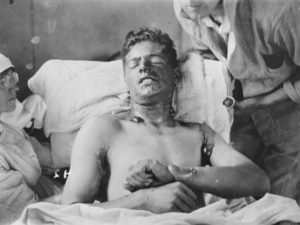 About 70 types of chemical weapons have been used in the past century, and they all fall into 5 categories. The symptoms can range from barely noticeable to very obvious, but most have the potential to be quickly lethal. Chemical weapons are classified as Weapons of Mass Destruction (WMDs), and many nations have held huge stockpiles in the past. The stockpiles have dwindled slowly from the Chemical Weapons Convention (CWC) in 1993, requiring many nations to destroy their WMDs. While some of these ‘destroyed’ weapons may just no longer be declared, three important nations continue to hold large declared stockpiles: Russia, North Korea, and the US. 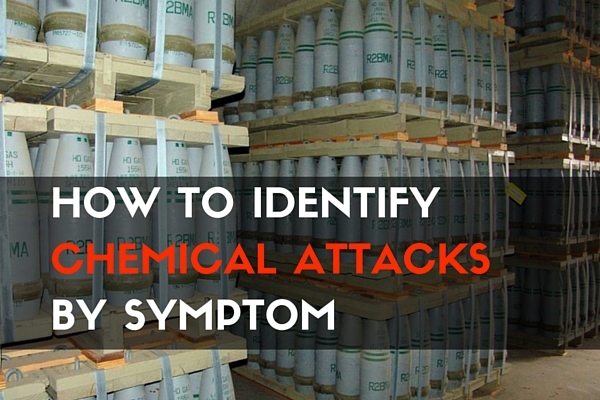 Many of the chemical agents have overlapping symptoms, but a few are unique to their type. Professionals look for these unique symptoms to estimate which agent is present solely based on symptoms exhibited by casualties. Nerve agents account for the majority of the stockpiles left in the world and are some of the most dangerous and deadly. They are very effective when weaponized and have the largest reach when used in cluster bombs. Nerve agents have been used by terror groups, such as in the Tokyo subway sarin attack. The agents can be absorbed through the skin, and cause a rapid onset of symptoms based on exposure levels. The main identifying symptom for detecting nerve agent exposure is constricted pupils. This video shows how quickly the fatal symptoms can occur and shows a goat dying painfully. Please skip this if you will find it more upsetting than educational. Blister agents are nasty, and usually loaded into mortars since they don’t have as large of an effective radius as nerve agents. Their main symptom is obvious from the name of the agent, and they cause pain over a long period of time if not fatal. Some of the more common blister agents do not show symptoms until 2-4 hours after exposure. The main identifying symptom for detecting blister agents is the large fluid filled blisters. 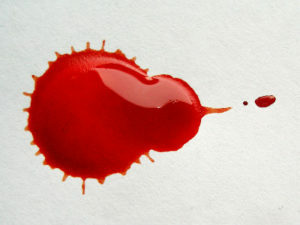 Blood agents are cyanide or arsenic based and work only through being breathed or swallowed. They are much more effective indoors than outdoors, since they disperse quicker than the other agents listed. They are named blood agents because they stop cells from using oxygen, causing victims blood to be bright red. The main identifying symptom of blood agents is the irritating smell of almonds or garlic. Choking agents cause the victim’s lungs to fill with fluid, which leads to drowning. 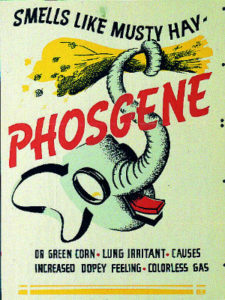 Phosgene and Chlorine gas are the two well known choking agents. The main identifying symptom of choking agents is coughing up bloody phlegm. Riot control agents are the chemical agent you are most likely to encounter. They are considered non-lethal and you may even be in possession of one. Pepper spray and tear gas are both used by law enforcement, and pepper spray can be be bought for personal protection. Deploying pepper spray at long distance is accomplished with paintball guns slightly modified to shoot pepper filled balls. The main identifying symptom of riot control agents is the forceful closure of eyes. This video shows the effects of tear gas on several soldiers. It also demonstrates the effects of extreme boredom in a combat zone. Almost all of the agents in each category are very destructive through inhalation. Avoiding chemical agents is near impossible without a protective mask. Many of them can also be effective through skin contact. Clothing can help some, but the clothing itself becomes contaminated when exposed. To learn more about the chances of a chemical attack, visit our TrueRisk section.